Saturday 21st April dawned bright and the temperature was well up for the time of the year. The wind was light and generally from the South East with a bit more breeze funnelling past the club start line. Dave Day and Sally sorted out the flags and courses in the Ops room in readiness to send the 8 competitors on their way for the 3rd and final spring pursuit race. First off was Len Cheshire in Sweet Friday at 1350 and was followed by Trifle some 5 minutes later. I’m not sure what Alan Grose in Popincoota was doing as he was white sailing and single-handed. He should have started with us but was a fair way back. Bob Chapple started at 1357 followed by Akamas minus her speed fenders at 1359. Beccy was trying with Jack Penty’s help to keep Martin in order! Kiamana having been OOD the week before had been moved back to 1402 which seems a bit harsh in the circumstances. General Khaos, Ian Jakeways was back in the ever-increasing time slots. With the advent of new mooring trots stepped on the western shore and closure between Frigate and Caldy tacking down the harbour has become quite a challenge. One day we will lose our club line and with it Saturday racing unless we can get a Saturday committee boat!!! So voice your concerns at every opportunity! We cleared the speed limit buoys and saw Popincoota coming down with more wind so we tacked over to get to the wind and up the western shore. A short dip of Popincoota’s stern led us into a lift and good breeze on port tack. Looking ahead I could see Sweet Friday ahead and to windward going well. Tai Mo Shan helmed by Charles Choak was also up there with him. I confess I did not see them start and have no start time. The wind pattern changed, Len and Charlie tacked onto starboard and hit the wall! No wind and what little there was massively headed them back toward St Just. Gaye picked this up and suggested we tack early which we did and made huge gains in breeze and course. Popincoota was now a long way behind with Bob struggling up the western shore by Governor. We got close to the narrows and tacked over to port and headed direct for the Castle Buoy the first mark rounding to port. Alan Grose had made a lot on us and was very close as we rounded the mark now in 1st place. He kept station with us flying our kite and him white sailing! The wind went aft, lots! Then forwards, lots more. We went from heading toward Vilt, the second mark, on a dead run and by the lee to a beam reach and then a tightly strapped kite going into Falmouth! Popincoota still kept coming with white sails pulling. Wilkie behind him dropped her kite and was making ground under white sails. Then the pressure dropped and the wind came onto a broad reach, stabilised and we slipped away with a great gybe at Vilt. A bit of a kite moment and off to the club turning mark. Then what! The wind is now back on the nose and we are struggling yet again to hold our course. A quick check saw Wilkie with rehoisted spinnaker, catching Popincoota and us. The wind came back behind us and we kept out of the strong ebb tide sliding along the now continuous moorings by Frigate and Caldy. We steadily increased our lead and rounded the damaged lifeboat on the fairway. 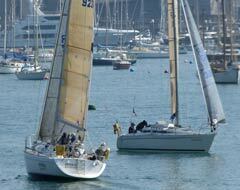 A gybe took us to the turning mark and Hoots from the club signalled shorten course. 111 was the course number, which signifies Trefusis port, so we rounded and set off down river. Popincoota and Wilkie were a good distance behind and we concentrated on the beat while watching poor old Nigel and Jess in Kiamana struggling in zero wind coming in from Vilt. At the pub later they told tales of woe and massive wind holes! Cat and mouse developed to the finish with Trifle taking the middle of the fairway and the two GKs hugging the Flushing side. They got wind and went ahead! We dropped back. Kiamana was beating out and had right of way so we went deeper and cleared our air and forged ahead. Our wind died and the GKs got pressure and went ahead. Fifty yards to the finish and it looked bad for Trifle when I saw Bob’s kite fold. Alan tucked inside of him had lost the wind which came to our beam in a macro zephyr! We went ahead and held it. Toot, kite down and 16 seconds later Wilkie made 2nd place with Popincoota a close 3rd. A close finish indeed with great relief on Trifle. Thanks to RO Dave and Sally, Giles the boat, Pauline Cheshire for great teas and Sue, Paul and Jeanette in the Ops room. That ends the series with Wilkie a clear winner on 7 points. I leave the other places to interpretation of the intricacies of Sailwave and the equal points scenario? Next Saturday sees the start of the Skinners Saturday series of 6 races taking us up to the 2nd June. After that the Village regattas take place! Where is the year disappearing? Resolving ties, or equal series-scores, is covered in Appendix A of the Racing Rules of Sailing, seldom the most rivetting read. 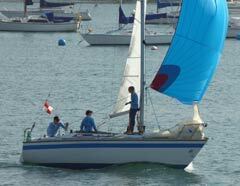 A8.1 covers the case where two (or more) boats have a series-score tie. The scores are listed in order from best to worst. At the first point where there is a difference, the tie is broken in favour of the boat with the better score. In the instance cited above, Kaimana has scores of 1,2,6, while Trifle has 1,3,5. Tie broken in favour of Kaimana. If that process fails to break the tie, A8.2 is invoked. Here the score in the last race is used to break the tie. Fortunately this happens only rarely, and never to the satisfaction of the losing helm.